John’s vision in Revelation 7:2-17 comes in the midst of judgments. 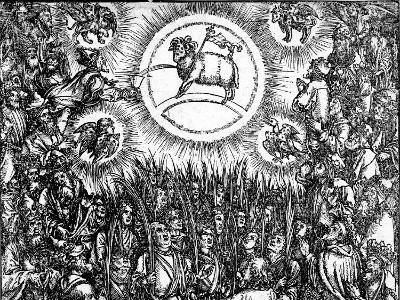 The Lamb is breaking open each of the seven great seals which enclose the scroll He took in Revelation 5:6-8. While the breaking of the seals tend to symbolize various judgments and fearful things happening on the earth, there is a comfort in knowing that the Lamb is the one doing these things. Such things are not beyond His control. As God permitted Satan to afflict Job (Job 1:6-12; 2:1-6), so also His fearful judgments of sinners will accomplish exactly what He intends them to do (Isaiah 55:10-11). Therefore, just before the seventh seal is broken, John sees a vision of angels numbering the sons of Israel. The destroying angels are restrained for a time according to the will of God, apart from whom nothing can happen. The numbering of the tribes itself is noteworthy for several reasons. First of all, unlike parallel numberings of Israel in passages like Numbers 1, the tribes are identical in size. Israel wandering in the wilderness had yet to come into their inheritance. Even within the promised land, they awaited a better country (Hebrews 11:13-16). Now, in this vision, Israel has come into her own. John sees in the people what Ezekiel had seen in the land: the portions are the same and God is in their midst (Ezekiel 48:1-29). However, unlike in Ezekiel, the names of the tribes have changed. Notably absent are two tribes: Dan and Ephraim. 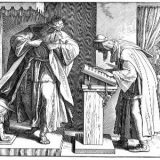 Further, while Manasseh is present, Joseph also appears separately in the list, which was not typical for this list in the Old Testament. As far as Dan is concerned, this tribe was the first to fall into gross idolatry in the promised land (Judges 18), and Jeroboam set up one of his golden calves in that territory (1 Kings 12:28-30). 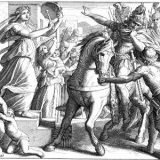 Dan’s absence therefore seems to be an indirect way of describing Israel finally purged of the idolatry for which she suffered so much. As for Ephraim, the prophets frequently, but not exclusively, referred to this tribe as the tribe of Joseph (Zechariah 10:6 and Ezekiel 37:15-23, for example). This may also recall Israel’s blessing of the sons of Joseph and the preference shown to the younger Ephraim (Genesis 48). Third, Israel is sealed prior to the vision of the great multitude later in the passage. This is not an incidental detail. As Paul says regarding Israel according to the flesh, “To them belong the patriarchs, and from their race, according to the flesh, is the Christ, who is God over all, blessed forever. Amen” (Romans 9:5). Christ also says on several occasions that He “was sent only to the lost sheep of the house of Israel” (Matthew 15:24). After all, God promised that the offspring of Abraham would be as numerous as the stars, and “in your offspring all the nations of the earth shall be blessed” (Genesis 26:4). Through Israel, as the elder brother, the blessing of Christ would come to all nations. Paul, of course, clarifies that belonging to Israel according to the flesh is not enough. “Without faith, it is impossible to please God” (Hebrews 11:6). But the Israelite who believes is a natural branch returning to his own tree. John sees Israel no longer hardened. “The Deliverer will come from Zion, he will banish ungodliness from Jacob” (Romans 11:26). Therefore, in that moment, the dividing wall of hostility has been broken down, and the two have become one (Ephesians 2:11-22). Israel and the nations have become one people, even as the honor shown to the believing and purified older brother persists to his glory for all time. John also sees the great ingathering of the nations. They have entered into their Sabbath rest, resting from all turmoil and pain and worshiping God who has delivered them (Hebrews 4:9-10). Thus, the Sabbath finds its fulfillment in the great Sabbath. What we experience now in the midst of toil, work, and pain, often only one day in seven, shall become the totality. Even our imperfect liturgical forms will give way like shadows before the light in the fullness of that great Day. No longer will our hearts be burdened with distractions and worries! No longer will our lips only mouth words of praise! “For now we see in a mirror dimly, but then face to face. Now I know in part; then I shall know fully, even as I have been fully known” (1 Corinthians 13:12). One of the elders asks John a question which John does not know how to answer, much like Zechariah (Zechariah 4:1-14). This elder seeks to instruct John, and us through him, so that the vision may be clear. Revelation is not a sealed book, like many of the apocalyptic books in the Old Testament (Daniel 12:9-13). It is meant to comfort those who are in tribulation now, for by knowing “the things that must soon take place” (Revelation 1:1), those who hear this prophecy will not be caught unawares. But the message is clear: here, in the midst of turmoil and tribulation, these saints now rest from their labors. The pains and sorrows of this world will soon come to an end. Purged of their sins, they will worship God in purity and sincerity. Free from their sorrows, they shall know a joy which knows no end. “And I heard a loud voice from the throne saying, “Behold, the dwelling place of God is with man. He will dwell with them, and they will be his people, and God himself will be with them as their God. He will wipe away every tear from their eyes, and death shall be no more, neither shall there be mourning, nor crying, nor pain anymore, for the former things have passed away” (Revelation 21:3-4). Those of us who still toil and labor can rejoice knowing that our Sabbath rest awaits us. But we can also take heart knowing that those who have departed in the faith now rest in Christ awaiting His glorious return. Then, as Israel and the nations have become one man in Christ, so we who are left until His coming will be caught up together with Him (1 Thessalonians 4:17). The Church will no longer be at war, but she will be His people, one holy Bride, resting blameless in His sight and alive in Him, never to die again.